Group represents wide array of political issues, including opposition to President Trump's Supreme Court nominee. 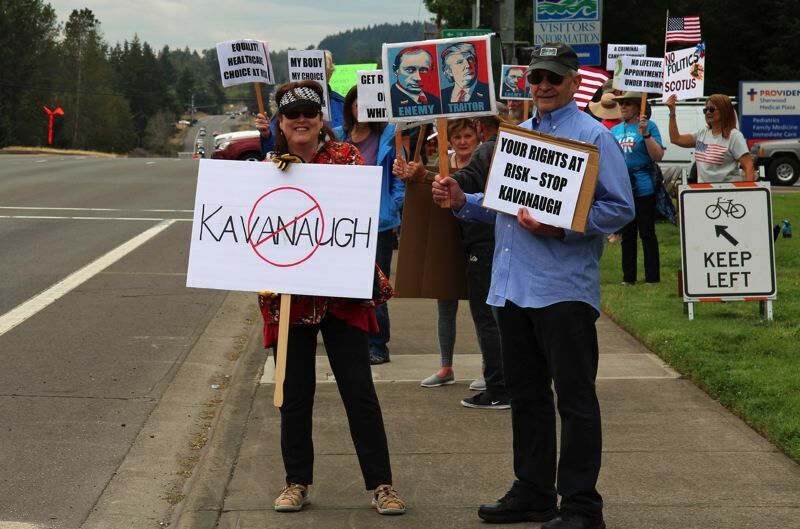 Protesters took to the intersection of Highway 99W and Edy Road in Sherwood on Sunday to rally in favor of the Justice Department investigation into Russian interference in the 2016 election, and to oppose the nomination of Brett Kavanaugh to the U.S. Supreme Court. Organizers said the event drew as many as 90 people. It was organized by Our Indivisible Revolution Sherwood. "It was about a lot more than that, too," said Patrick Briggs, one of the organizers. "It was an intersection — literally and figuratively — of a lot of progressive issues." The protest drew a wide range of reactions, he said, from indifference, to positive feedback, to negative. Maddie Gavel-Briggs, another organizer, said Our Indivisible Revolution Sherwood is a hybrid of the "our revolution" movement that came out of the presidential campaign of Vermont Sen. Bernie Sanders, and the "indivisible" progressive movement that sprang up after the election of Donald Trump. "Protesting is good but it doesn't end there," Gavel-Briggs said. "It's good to have the outlet of protesting but ... you can't have any change unless you do the electoral work." The group has been canvassing for Democratic candidates to the Legislature, Briggs said, and for issues such as Ballot Measure 101, which voters OK'd in January to increase the percentage of Oregonians with access to health care coverage. Other issues range from the environment to women's rights. "We have roles for everyone," Gavel-Briggs said. "If you're not a door-knocker, you can be a postcard-writer. ... If you're not out there participating, you're going to get the government you deserve."